The Harleigh B. Trecker Library traces its roots to 1939 with the establishment of the University of Connecticut’s extension offerings in downtown Hartford. 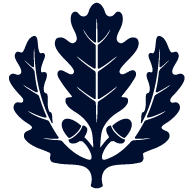 1939 is an important date in UConn’s history since it is also the year the Connecticut State College became the University by an act of the state legislature. 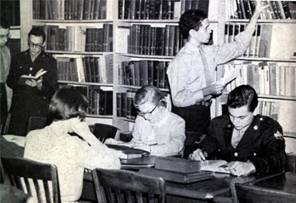 During the 1930’s and 1940’s, the program and its library moved to various schools as it continued to advance. World War II brought a huge growth spurt as UConn was called upon to train factory workers for the military effort. What was once a small extension effort blossomed into a full-blown branch campus in 1946 as war veterans returned and sought heavily subsidized college educations under a federal government program called the G. I. Bill. Through this period the library, started in the corner of a room, soon occupied one and then several rooms (right). 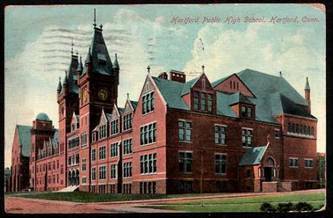 In the early 1950’s, the Hartford Branch moved to its first real campus at an Asylum Avenue site called the Goodwin Estate. The main classroom and administrative offices were located in the estate’s mansion while the library, some faculty offices and other operations took up space in the estate’s former horse stable (left). Students, faculty and librarians of the time noted that on rainy days the odor of hay permeated the place even though the horses were long gone. 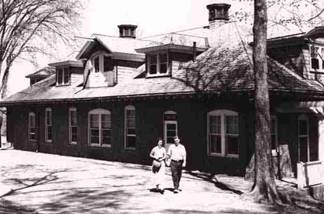 In 1970, the Hartford Branch moved from Hartford to West Hartford and the library relocated from its stable to the upper floor of a new building which, while reportedly lacking in Goodwin’s charm, at least brought library services into the 20th Century. The former library space is now the campus’ Gampel Student Center. 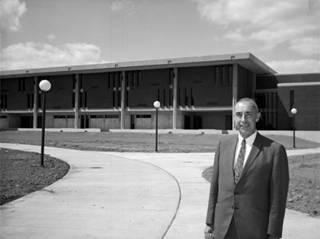 The Undergraduate Building is shown at right with long time campus director Wilber Griswold. 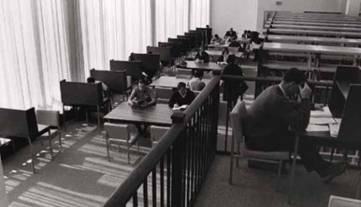 The Hartford Branch library served mostly undergraduate students but three other graduate-level libraries also figure into the history of the Trecker Library. In the early 1960’s, the University’s Law School moved from a west-end Hartford mansion to a newly built campus on Asylum Avenue in West Hartford. This splendid edifice contained a state-of-the art (for its time) library space which would eventually become the home of the current Trecker Library. Another Hartford area graduate program, the School of Social Work, relocated to the same site as the Law School in the late 1960’s. Social Work, which dated from the 1940’s, had its own well stocked library (left) which opened in the basement of the new Social Work building. It too would later be blended into the present library operation. This space is presently home to the Zachs Community Room. And finally, the Hartford-area Masters of Business Administration operation, which until 1985 occupied its own Hartford mansion, also operated a library later merged with the others to make up today’s Trecker Library. The 1985 date just mentioned is a pivotal one since that is the year the Law School moved back to Hartford to occupy the campus of the Hartford Seminary which had undergone a significant downsizing. After lengthy debate, it was determined that the old Law School building (shown at the header and which still has that name on its cornice) would remain the property of UConn and that several new services would reside there, including a library bringing together the separate units from the undergraduate, Social Work and MBA programs. 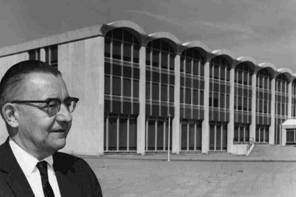 The name “Harleigh B. Trecker Library”, celebrating a long-time dean (right), was already in use for the Social Work Library and so it was carried over to the new operation a few months after the combined library was put into service. The Harleigh B. Trecker Library of today (until its closing in 2017) has changed in many directions since its opening almost 25 years ago. 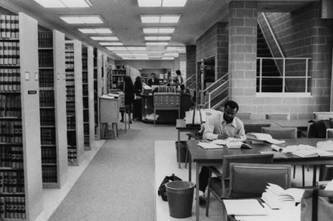 Photos of the Law School Library just before it became Trecker (left) show very typical library operations of the time with books and journals packed into thousands of feet of shelf space, huge tables for consulting massive reference tomes, extensive card catalogs, and staff members demanding quiet. Through the years, though, one thing has not changed: the desire of the library’s staff to work with the campus community to give the best service possible to meet a variety of important academic needs. 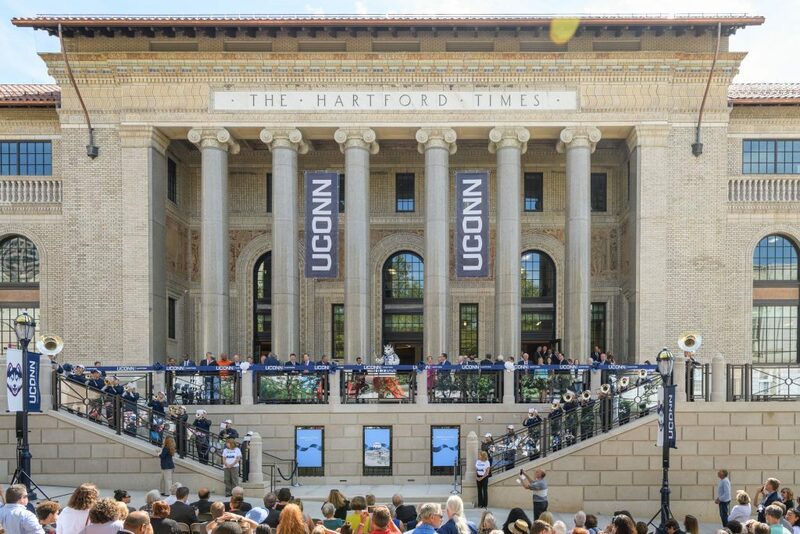 In 2014, the University of Connecticut announced a new UConn Hartford campus in downtown Hartford would be established, replacing the UConn Greater Hartford Campus in West Hartford, Connecticut. This new campus was designed from day one to be a campus which integrates into the surrounding community through partnerships to enable classes and activities to be held throughout the neighborhood. This new campus would include space for the Hartford campus library within the nearby Hartford Public Library, with this concept and partnership being informed by the San Jose State University model. 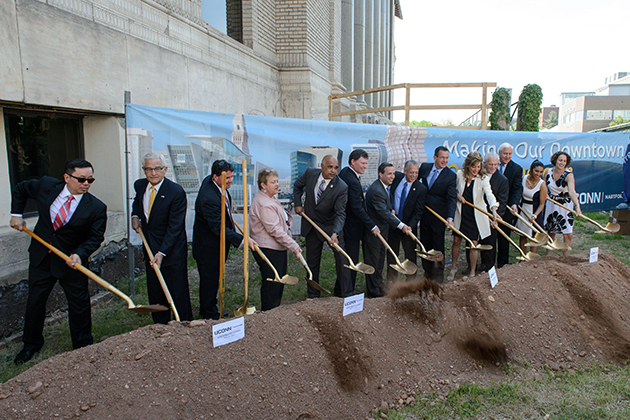 Ground breaking for the new UConn Hartford Campus took place on May 18, 2015 at the nearby Hartford Times Building which would become the main building for this new campus which would include spaces at 38 Prospect Street for the School of Social Work, the UConn Library being within the Hartford Public Library, and expanded spaces at the existing UConn School of Business Graduate Business Learning Center (GBLC) [Press Release]. In Fall 2016, construction for the UConn Library spaces within the Hartford Public Library begins with work continuing over the next several months until June 2017. While this work was ongoing, the staff at the Trecker Library were reviewing collections, identifying collections to be relocated either to Hartford or Storrs, and items to be donated to Better World Books to provide other libraries throughout the world to utilize these materials. The moving of a library is a monumental task and by the end of June 2017, collections were relocated to their new library space. 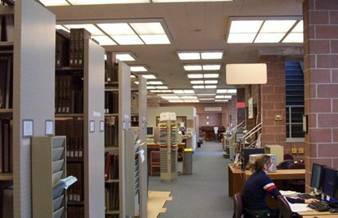 On July 2, 2017, the new UConn Library at Hartford Public Library staff reported to work in their new offices to begin setting up services, spaces, and preparing collections for the public. Library services launched with limited services to the public on July 10, 2017 and over the coming weeks staff worked to prepare for the launch for the fall semester 2017. On August 23, 2017, the new UConn Hartford Campus was dedicated with tours of the new facilities offered to the public after the ceremony [Press Release]. This included a tour of the UConn Library at Hartford Public Library as all spaces were ready for a preview before the official opening on August 28, 2017 to the public. The full launch of the library occurred on August 28. 2017 on the first day of the Fall Semester. Students and members of the public were greeted by Hartford Public Library and UConn Library staff and almost immediately the students become an integral part of the Hartford Public Library. The partnership of these two libraries to create a library within a library has provided UConn faculty, staff, students as well as the Hartford community with a diverse range of collections, programs, and resources which provide multiple opportunities for lifelong learning. The success of this partnership between an academic and public library is evident on a daily basis as UConn and Hartford Public Library community members interact, engage, and connect via public programs, learning spaces, and in the classroom.